Bored of eating the same omelet or scrambled eggs for breakfast? Or the fried eggs for lunch? It is time you try something new. And, Japanese egg recipes are the best deal here. 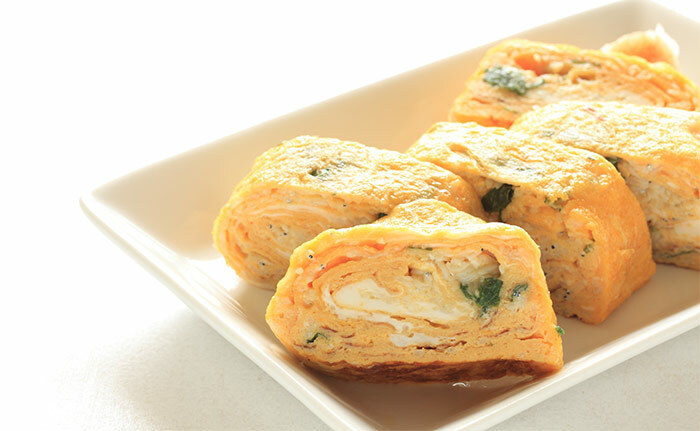 Be it for breakfast or for lunch, these egg delights render a rich touch. While the preparations are simple and easy, not requiring any special culinary skills, you just need to be a little careful while presenting the same to retain the authenticity of the cuisine. 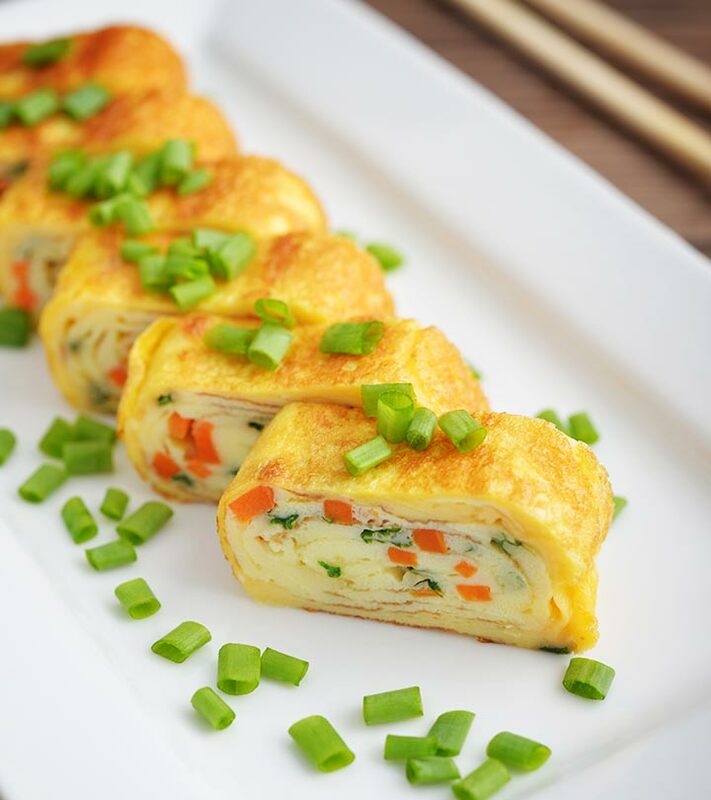 Thin layers of eggs are cooked and then rolled akin to logs with the help of Tamagoyaki pan, an exclusive rectangular-shaped pan. 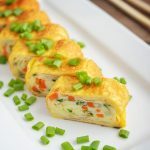 There is no fixed seasoning for this particular japanese egg omelette recipe and you can incorporate your creativity here. In a medium sized mixing bowl, add soy sauce to mirin and salt, and mix well. Crack in eggs and using a spoon, mix the mixture until well-combined. Place a medium rectangular-shaped pan on medium to high flame and heat the oil. Divide the egg mixture into 6 equal portions. Pour one portion of the egg mixture into the pan as a thin layer, swirling the pan so as to ensure that you get a very thin layer. Wait until the bottom of the egg is completely set and liquid is left on the top. Start rolling into a log and allow it to rest on one end of the pan. Add one more portion of the egg mixture. Allow this layer to get set completely. Once set, roll the cooked egg layer in the opposite direction. Repeat the process until the entire egg mixture is used and the egg now resembles a thick piece of log. Remove and arrange on a plate. Cut into ½ inch pieces and serve. Here comes another delicious japanese egg rice recipe to try out! Ketchup drenched fried rice is stuffed within fried eggs which are thin like crepe. This doesn’t sound really Japanese, but the fact remains that it came into existence during the 1900’s. It is quite popular among kids. 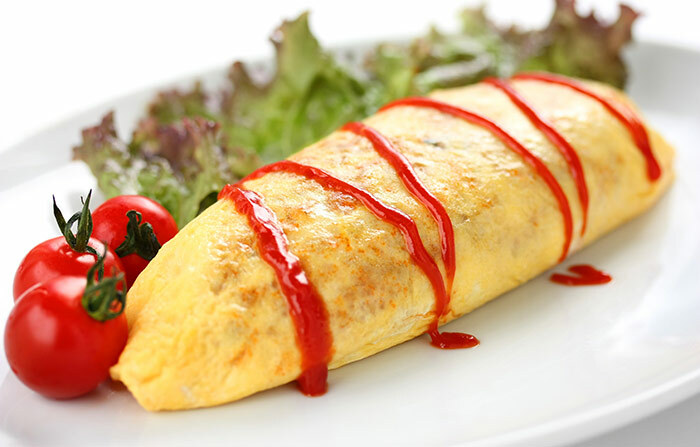 While the traditional Omurice gets its finishing touch with ketchup, you can use a thick, creamy sauce or a glazing brown sauce for added visual appeal and taste. 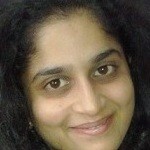 Place a medium frying pan on medium to high flame, and heat butter with oil. Add chicken thigh pieces and cook for about 3 minutes. Mix in onions and cook until the onion turns translucent. Mix in rice and cook for 3 more minutes. Make a well in the centre of the rice and add the ketchup. Cook for ½ a minute more. Mix the rice and ketchup well and fry for 2 minutes. Mix in peas and cook until the peas turn soft. Take a medium sized bowl and pack it with half the rice. Unmold it on a plate. Repeat the same with leftover rice. In a small mixing bowl, beat eggs with salt. Place a frying pan on medium to high flame and heat half of the oil. Add half the egg mixture and swirl the pan to get the thinnest possible crepe. Once the eggs are completely cooked, use the crepe to cover the molded rice to give an oval shape. Drizzle the ketchup atop the rice and serve. 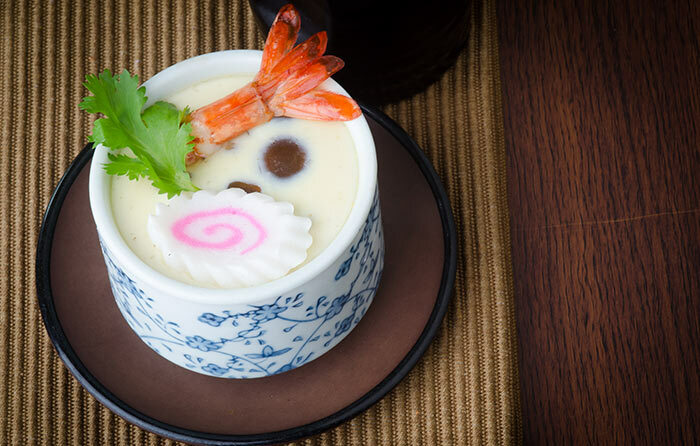 Treat your friends to a hot appetizer with this easy-to-make Japanese steamed egg custard recipe. ‘Chawan’ in Japanese stands for rice bow or tea cup, while ‘mushi’ is a term for steamed. In short, this is nothing but steamed egg in a cup. While the dish’s texture is akin to egg flan, it gets its flavor from the blend of mirin, soy sauce, and dashi. Check out the recipe. In a small mixing bowl, mix ½ tsp sake with equal amounts of soy sauce. Add chicken pieces, toss well, and keep aside for 10 minutes. In another mixing bowl, mix ½ tsp sake with equal amounts of soy sauce and add shrimp pieces to it. Toss to ensure even coating and keep aside for 10 minutes. In a large mixing bowl, mix dashi with rest of the soy sauce, mirin, and salt. Crack in eggs and using a spoon, mix the mixture so that the ingredients blend well. Using a sieve, strain in as much of the egg as possible. Divide the chicken, shrimp, and shiitake into 4 equal portions. Arrange one portion each in 4 cups. Top up with equal amounts of egg mixture in each cup until the cup is ¾th full. Using an aluminum foil, cover each of the cups and arrange in a steamer. Steam the mixture on medium to high flame for about 15 minutes or until a wooden skewer inserted comes out clear. Garnish with chopped spring onions, cover, and steam for 2 minutes. 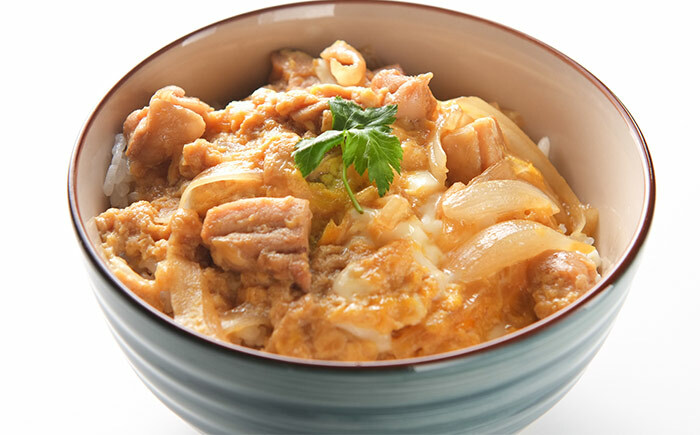 Egg and chicken simmered in a seasoned broth is poured atop hot rice packed in a bowl, and served hot – that is the simplest way of explaining this dish. A one bowl meal, it is a healthy dish with zero added oil. Plus, you can make it in an effortless way. The flavors of fluffy eggs and dashi blend with the rice, making this dish purely addictive. In a small mixing bowl, mix dashi with soy sauce, mirin, and sake. Place a medium sized saucepan on medium to high flame. Add dashi mixture and heat until the mixture starts boiling. Mix in onion, lower the heat from high to medium, and cook for about 60 seconds. Mix in the bite sized chicken pieces and continue cooking on medium heat till the chicken is well-cooked. Pour beaten eggs atop the chicken mixture. Cover with a lid, and cook on medium heat, for about 60 seconds. Fill a rice bowl with steamed rice. Pour the egg and chicken mixture along with the sauce atop the rice placed in the bowl. Don’t get carried away by the image. 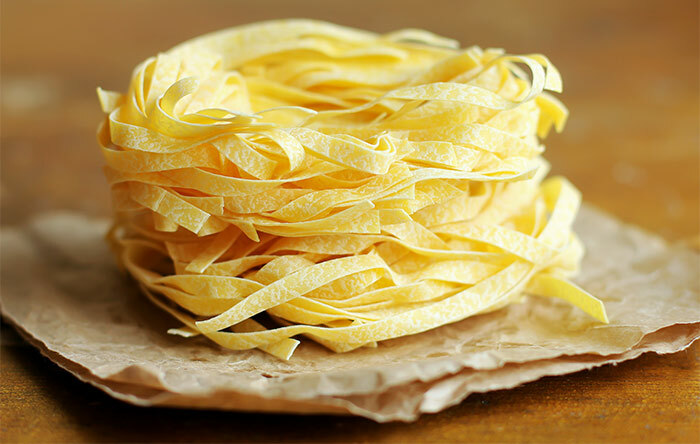 This is not linguine pasta. These are egg crepes that are shredded; it is not just a dish on its own. It could be used as toppings for sushi and noodles. The Japanese generally do not eat these shredded crepes as such. However, if you want you can toss them with a handful of nuts and roasted veggies, and enjoy it as a meal. This is definitely one of the best Japanese sushi egg recipe to try out. In a small mixing bowl, beat eggs with salt, using a wire whisk, thoroughly. Place an 8 inch frying pan on medium to high flame. Add oil and swirl to ensure that the pan is evenly and completely coated. Divide the egg into 4 equal portions. Add one portion of the egg mixture and swirl the pan to get an extra thin crepe. Flip the egg over and cook for 2 seconds more. Remove immediately from the frying pan. Repeat the same process until the entire egg mixture is used up. Once the crepes become slightly cool, roll them up. Using a sharp, non-serrated knife, cut the crepes into 1/8 inch thick strips. These are my top 5 picks when it comes to delightful egg recipes from the enormous Japanese cuisine. It doesn’t matter if you are a pro or a beginner; everyone can try these recipes with the same ease. So, what are you waiting for? Try these today and treat your family. Have you ever tried any Japanese egg recipes? What was your experience? Share with us. We are just a scroll away.